Prang studied as an experience designer at Konstfack and runs Another New Design Studio and has been approaching themes like food, caring for elders and funerary practices in fresh ways. 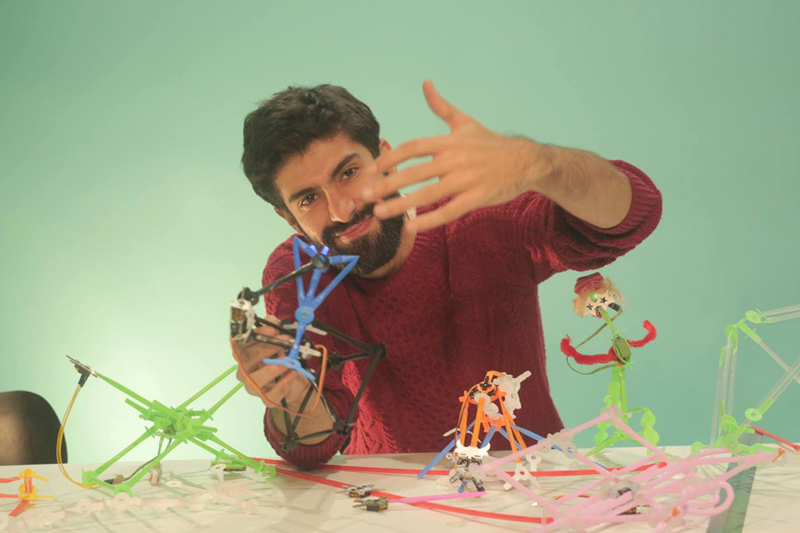 Paulo Barcelos researches ways to make humans relate to machines in a more pleasant and meaningful way - and is behind projects like Kids Hack Day ‘Quirkbot’, a microcontroller that let kids make their own robots with drinking straws. # What are you presently working with - and how does that relate to your mission as a designer of experiences? Prang: I’m working with Memory Spheres, which uses olfactory memory to improve the psychosocial of palliative care. And together with Paulo, we work with ‘31T Jr.’. We see that ‘being food-smart’ is a part of school education since it is an important skill in order to lead a well-being life and a well-built society. I design with perception and behavior as objectives. First, I define ‘duration’. And within that time, I create a platform that can enable the objective. I don’t design the information for people to take. I would be naive to think that I could do it better than them. Hence in my design, humans are a factor that contributes to the experience and the outcome. Each person generates content that is meaningful to them using own knowledge and background. Paulo: Besides 31T, I am juggling my time between the ed-tech startup Quirkbot, the maker education movement Kids Hack Day and the R&D department of Oakwood Creative, a digital communication agency. Across all the different projects I use technology as a way of expression, and create tools and environments that help people reclaim their curiosity and creative drive. As the Head of R&D at Oakwood Creative, I’m constantly trying to invent different ways to use tech as a communication tool and making sure that all the employees of the agency - not only designer and developers - have a close and positive relationship with different technologies. The only way to stay ahead of the curve is by creating an working environment where the dialogues about technology are open and accessible. # What does the Internet of Things mean to you? How can we best find a language to talk about how the virtual and analogue world is merging? Paulo: When it comes to human perception, I believe bits and atoms are very similar things. When we experience the world, we do so by creating mental models of the things we see, hear, touch, taste and smell. These models feel as real their physical counterparts, even though they are made up entirely out of “virtual” information in our brains. Same logic applies to the relationship between the digital and the physical worlds: a product that you buy online is as real as the one you buy at a store, the friends you talk to on social medias are as human as the ones you talk to face to face. On our daily lives, our brains don’t really draw a line between the physical and digital worlds, and this is something we can use to expand the limits of our perception. That’s what the Internet of Things is all about, a way to blur the differences between atoms & bits. If we want to find a relevant language to talk about the merger of virtual and analogue we should start by treating them as exactly the same thing. # Death and food seem to be recurring themes in your work. How do you imagine design will change these very central human issues in the years to come? Prang: Wow, I didn’t notice that before your remark! It might be that design results are mostly for happy and wealthy people. But design thinking can do much more. So, I look at some really fundamental aspects in life that still need improvement. You know the thrill when you see a creation of something that is obvious, and for that very same moment you wonder why we’ve spent efforts and resources creating thousands of irrelevant things. As everyone knows that the object era is over, the planet can’t simply sustain that trend. Values and satisfactions that drive consumption should come from meanings. Design, among other disciplines, can coax and induce that. # Working with death and funerary practices specifically, you seem to be touching certain taboos and deep cultural patterns, including religion. Are there limits to what we should touch upon with design - and where do they go? Prang: I don’t feel taboos. I see religion as a lifestyle, like your taste in music. People can believe that the band they adore is the best in the world, helping them to find themselves and providing vital life guidance. That is just great. However, my truth is not your truth and one size fits one. If you love your jeans, who should tell you that you need new designer jeans? I design to find a solution that values what religions fail to offer me. Together with others who share the same notion, we may form a tribe which may be growing in size. The limit with design, I guess, is when the design fails. Innei by Prang Lerttaweewit, Hironori Tsukue & Mischa Billing - Wallpaper* Handmade 2013, Thailand. Spirits stop ageing after being bottled. This oak bottle rewards time that the spirit sits on the shelf. Due to surface:volume ratio, the bottle functions as time accelerator. Prang: Do you mean workspace as for office people? Convertible. An office that lets individuals be while getting the most of what talents they have to offer. The space that doesn’t mold people but can instantly be modified to suit particular individual or task. Corporate mindsets are out. The place that yields an environment that maximizes individuality for productivity will get the best persons. Paulo: It can look like anything. Some people like to work from home, some from a café, some from a cubicle. Some like to have flexible hours, some like it strict. Some like to be in groups, some rather be alone. The workspace of the future is the one that embrace uncertainties and treat people like people and not like resources. # Do you have an interesting book to read, a place to discover, a person to meet, or something else that can be gifted in a couple of lines of text? Prang: Oh Nik, I’ll rather need you to give me a tip on that. Dog park visits and dog-cookie baking have drained most of my time lately. But some old reads that I like includes: for a slow read, “Thinking Fast and Slow” by Daniel Kahneman. For a fast read, “The Dip” by Seth Godin. Our planet matures too fast. Maybe we should do less things, but do with more meanings. Paulo: I think one of the most inspiring things I’ve came across lately was the work of Chris Ulme. He is a teacher working actively to build “Special Books by Special Kids”, a platform where people can learn about and respect neurodiversity. I highly recommend following his work and watching his videos! Kids Hack Day (co-created by Paulo Barcelos) is "a global series of free creative tech events for kids. We give kids tools to express their creativity, be curious and empathetic towards each other and the world around them. We empower kids to take control over their own future and not just passively consume what someone else has designed for them." Sådd, by Prang Lerttaweewit & Nämnden för hemslöjdsfrågor proposes a new funeral trend by crossing Urban Ecology and the Internet of Things to celebrate life. By floating ink on the water and using breaths to create pattern, each print is unique. Just like life, we can not fully control it but we could appreciate beautiful details that happen by chance. Quirkbot is a little character that let kids build and program their own toys. It supports the hacker-mindset, encourage kids to re-invent the things around them and makes it very easy to learn about electronics, programming and mechanics. 31T, is an inter-creative fine dining apparatus. First, a long table with 60 elements of first-rated tidbits prepared by A-list chef arranged in color spectrum. Second, guests are to create limitless starter, main dish, and dessert by making a combination of 3. Now comes the beauty part when everyone shares the findings — rate and describe it on a smartphone.